My husband and I went to Italy on our honeymoon earlier this summer and it is quite probable that after eating pasta for 12 days straight, I will never look at it the same way again. I’m sure you’re imagining that I got totally tired of it and never wanted to look at another carb again when I got home, but it actually had the opposite effect! All of the pasta dishes I ate in Italy were made with fresh noodles, simple sauces, clean flavors, and lots of veggies. Even the cream sauces somehow tasted light. I’m really not sure how they did it, but it definitely inspired me to try to infuse some of that Italian spirit into my pasta dishes when I got back home. Summer is winding down and we are definitely entering a season where comfort food is king, but that doesn’t mean that all vegetable consumption has to come to a screeching halt! 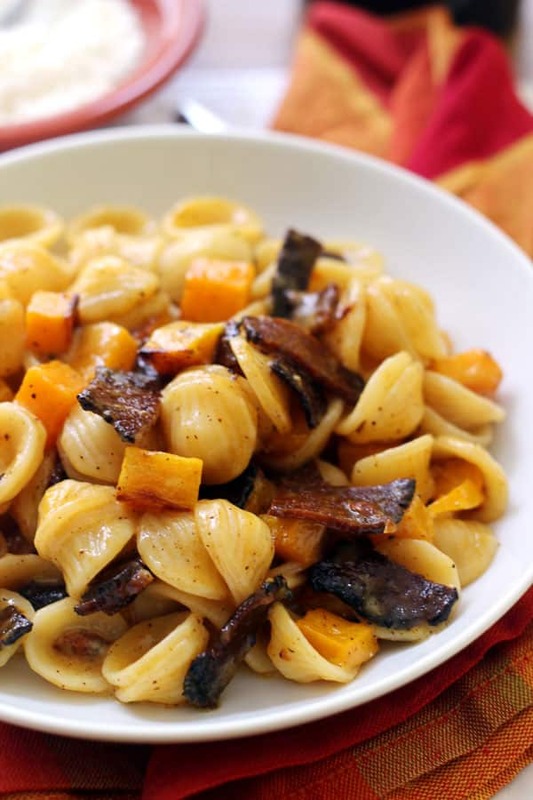 Enter this vegetarian butternut squash pasta carbonara, which has a very comfort food feel, but also packs a lot of veggie punch in every bite. Pasta carbonara is a traditional Roman dish, usually consisting of some sort of noodle (fettuccine, linguine, spaghetti) mixed with an egg sauce, bacon, parmesan cheese, and black pepper. Here we’ve substituted vegetarian bacon for pork bacon, using it to add smoky umami flavor to the dish. The egg sauce is made by mixing raw eggs with parmesan cheese, and tossing the mixture with the just-drained hot pasta. The egg mixture starts to cook when it hits the hot pasta, but by constantly stirring as you mix it in, it forms a creamy sauce instead of becoming scrambled eggs in your pasta pot. I’ve used orecchiette here because I like how they scoop up the sauce, but really any pasta shape will do. Butternut squash roasts away in the oven while this all cooks and it gets tossed in to the final pasta dish, adding a hint of seasonal sweetness and a lot of vitamin A. I can’t say that this is exactly how real deal Italians would make this dish, but I definitely have a feeling that they would approve. With roasted butternut squash, this meatless version of Pasta Carbonara is perfect for fall. Toss the butternut squash cubes with 2 tablespoons of the olive oil and spread on a parchment-lined baking sheet in a single layer. Season with salt and black pepper. Roast for 30-40 minutes, or until tender. Remove from the oven and set aside. Meanwhile, bring a large pot of salted water to a boil. Cook pasta according to package directions or desired tenderness. Drain and set aside, reserving 1/2 cup of cooking water. While the pasta cooks, heat the remaining olive oil in a nonstick skillet over medium-high heat until shimmering. Add the vegetarian bacon to the pan and saute for 5-6 minutes, or until crispy, stirring occasionally. Stir in the garlic and sauté until fragrant, another 30 seconds. Remove from the heat. In a medium bowl, whisk together the eggs and parmesan cheese. Slowly add the egg mixture to the hot pasta, stirring constantly so that the eggs will cook but not scramble. Add in cooking water as needed to reach a sauce of desired consistency. Stir in the butternut squash cubes and the bacon-garlic mixture. Season to taste with salt and black pepper. Serve warm. I used Hickory & Sage Benevolent Bacon for this, but I’ve also had good results with Lightlife Fakin’ Bacon Tempeh Strips. This looks like a fabulous fall dinner! I’m adding it to my must-try soon list! Thanks Lori! It definitely gets the fall spirit going. This looks delicious! 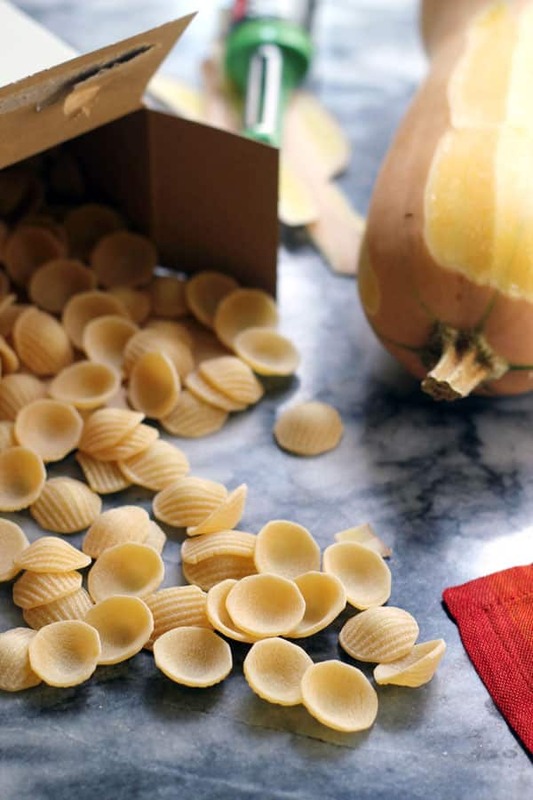 I love butternut squash in pasta recipes. A friend of mine has been living in Italy for about a year and a half and said she’s yet to tire of the pizza and pasta! I really think I could have stayed in Italy forever and never tired of the food. Hope you enjoy the pasta if you try it! This sounds absolutely delicious! Butternut squash or (butternut pumpkin) is my favourite pumpkin and I can already imagine its nutty sweetness when roasted. Totally agreed. Roasted butternut squash is nature’s candy! Wow – this looks delicious!!!! This dish sounds delicious 🙂 however, I’d have to substitute the parmesan cheese as it isn’t vegetarian. I made this tonight and enjoyed it. I added thyme and substituted tofurkey brand italian sausage, sliced and sauteed for the veggie bacon.